UNITED NATIONS: Both the Israeli army and Palestinian militants committed war crimes, and possibly crimes against humanity, during the December-January Gaza war, the United Nations charged on Tuesday. A 575-page report by a fact-finding mission organized by the Geneva-based UN Human Rights Council called on both sides to thoroughly investigate the allegations. Israel did not cooperate with the investigation. "The mission concluded that actions amounting to war crimes, and possibly in some respects crimes against humanity, were committed by the Israel Defense Force," UN investigator Richard Goldstone told reporters. The report also said rockets fired by Palestinian militants into Israel where there were no military targets would also constitute war crimes, and perhaps crimes against humanity. In response, Israel's diplomatic mission in Geneva issued a statement that criticized Goldstone's mission and explained why Israel did not cooperate with it. "Its mandate was clearly one-sided and ignored the thousands of Hamas (Palestinian militants) missile attacks on civilians in southern Israel that made the Gaza operation necessary," the statement said. A Hamas spokesman in the Gaza Strip rejected the suggestion that the Islamist group's firing of rockets into Israel could also amount to war crimes. He said it was self-defense, which is "a right sacred under international law." Goldstone, a noted South African jurist, recommended that the UN Security Council call on Israel to fully investigate possible crimes committed by its forces. His report made clear that Palestinian authorities should do the same regarding crimes committed by Palestinian fighters. The probes should be "independent and in conformity with international standards" and establish a committee of human rights experts to monitor any such proceedings in Israel and the Palestinian territories. If either Israel or the Palestinians fail to do so, then the 15-nation council should refer the situation in Gaza to the prosecutor of the International Criminal Court in The Hague, the report said. Goldstone said Israeli efforts to investigate allegations of war crimes by its soldiers had so far been "pusillanimous." 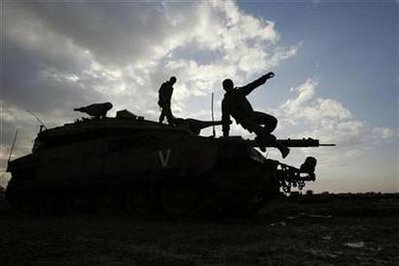 The Gaza war, codenamed Operation Cast Lead, began on December 27, 2008, and ended on January 18.